After years of being labeled as "potential flop," Marvel Studio’s Guardians of the Galaxy emerged as the biggest Hollywood phenomenon of 2014 when it was released this past August. With a box office take of $330 million, the movie is far and away the biggest domestic hit of the year, and the love has spread around the world. As luck would have it, it’s also the kind of film where you can start pulling back the layers and discover all kinds of fascinating stories and facts about how the movie got made. We’re practically learning something new every day about Guardians of the Galaxy, and the upcoming Blu-ray release will only enlighten fans further. Yesterday morning, I was invited to a small screening of the special features that will be featured on Guardians of the Galaxy’s upcoming home video release, and watching the various featurettes, deleted scenes and other video material I learned a whole bunch of cool new pieces of trivia about the film. And I’m happy to share with all of you! At the time it was built, the Empire State Building was the tallest skyscraper on earth, and to its tip it stands at a tremendous 1,454’ tall. 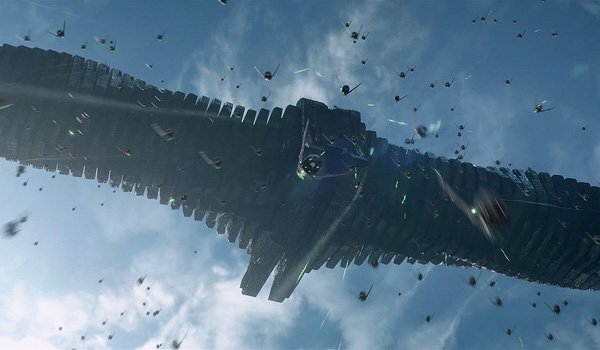 That, however, is nothing compared to the size of Ronan The Accuser’s gigantic spaceship, The Dark Aster. In fact, actor Lee Pace makes a direct comparison between the two on the Guardians of the Galaxy Blu-ray, and notes that the Dark Aster is as big as the Empire State Building turned over 11 times (that’s 15,994’ feet for those of you too lazy to open your calculator apps). It’s not a surprise that most people in the universe were terrified of him. The cosmic universe that James Gunn built for Guardians of the Galaxy actually goes far beyond just what we see in the finished cut of the film, as the filmmaker mapped out every little detail you can think of . A great example of this is the reasoning behind the three circular lights on the Nova Corps armor: they are meant to represent the three suns of Xandar, the peacekeeping organization’s home planet. 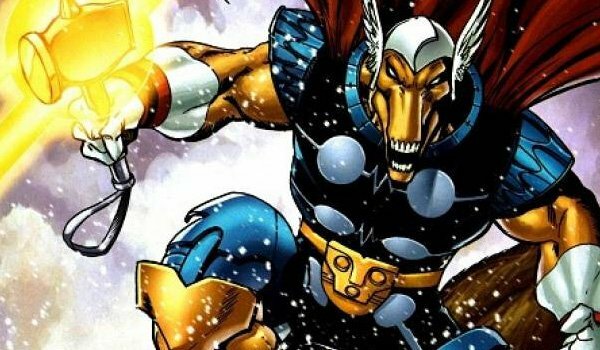 Die-hard Guardians of the Galaxy fans likely already know that Sean Gunn – James Gunn’s brother – did most of the on-set work as Rocket in the film, but what you may not know is that there were actually two actors who did that job. Arti Shah, a little person, was also part of the production – but what’s funny is that she was actually a bit too tall for the job. 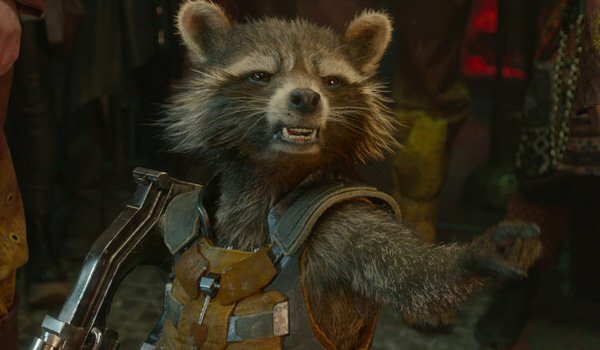 While Sean Gunn was able to crouch down to Rocket’s height, giving his co-stars a proper eye-line, Shah had to wear an image of Rocket on her chest. 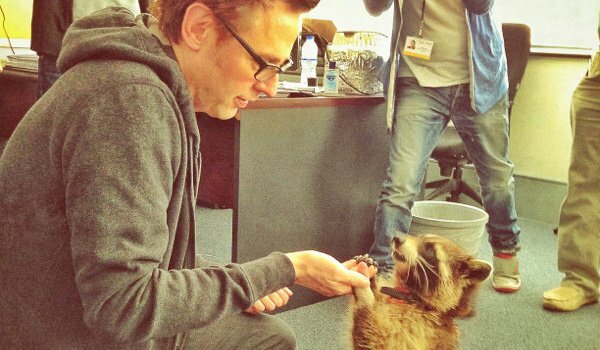 In order to help properly capture what the big screen version of Rocket should look like, director James Gunn had a real raccoon, named Oreo, brought to set. 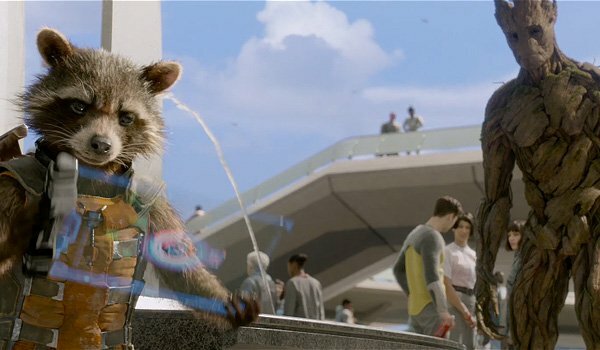 Not only did the animal prove to be very helpful for the production – it’s said in the bonus features that Oreo was the basis for a lot of what Rocket is – but James Gunn even wound up bringing him to the Guardians of the Galaxy premiere in Los Angeles. It’s certainly a clichéd saying that the eyes are the windows to the soul, but it’s honestly an incredibly important element in the creation of CGI characters. 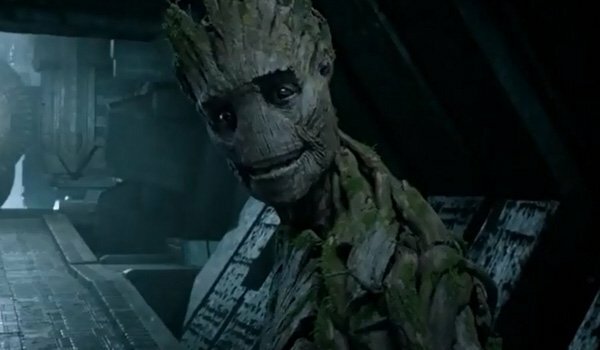 If audiences are going to believe that Rocket and Groot are real and feel for them emotionally, they need to be able to look into their eyes and read something. 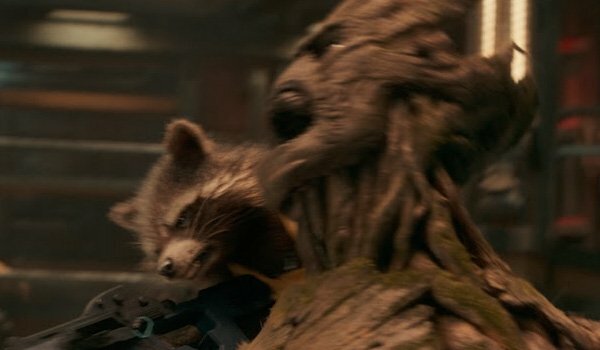 For Groot it was about capturing a certain level of innocence, while Rocket’s eyes are meant to reflect his animal nature. One of the key elements in designing Rocket was showcasing the fact that he is the result of extreme scientific experiments that transformed him into the intelligent, bi-pedal alien that he is. To determine the best way to show this, the artists simply followed the idea of design following function. For example, a normal raccoon’s chest is much narrower than Rocket’s, so the filmmakers needed to find a way to show that the character’s sternum and rib cage have been expanded (hence why his back is covered in scars and metal bits). 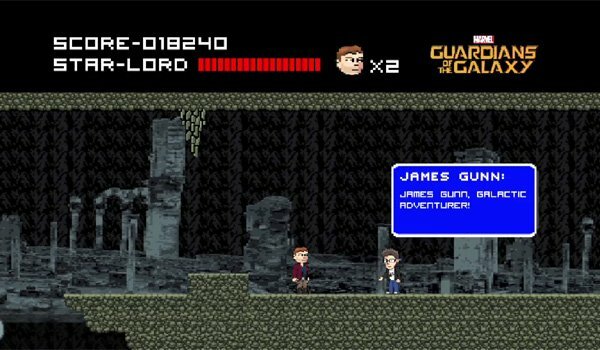 The extended featurette that will be featured on the Guardians of the Galaxy Blu-ray is split up into multiple sections (each one dissecting a different aspect of the production), but between each one is an awesome little 8-bit cartoon recreating scenes from the movie… with a twist. Not only does director James Gunn show up in all of them, there are also some very funny cameos from Thanos and even Marvel Studios President Kevin Feige. There’s even a Baby Groot edition of Dance Dance Revolution! In a side-scrolling recreation of the first scene on Xandar (where Peter Quill first tries to sell the orb), there are two characters in the background that fans of Marvel Comics will get a good laugh at. Standing together you can see Beta Ray Bill (the first non-Norse character who was worthy of wielding Mjolnir) and Starhawk (a member of the original Guardians of the Galaxy team introduced in 1969). They don’t actually say or do anything, but it’s a fun cameo. 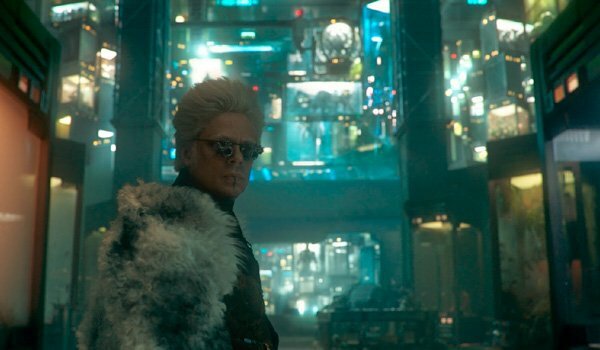 Speaking to director James Gunn before Guardians of the Galaxy’s release this past summer, we got the filmmaker to reveal some of the cool Easter Eggs hidden in The Collector’s museum, but the featurette on Blu-ray fully delves into the scene. The behind the scenes video not only reveals and highlights certain things you may not have caught, but also features sine behind the scenes footage that shows them up close. It’s all there, from Dark Elves to the slugs from Slither. For what should be rather obvious reasons, scenes in gag reels typically don’t feature finished visual effects, but the filmmakers decided that it was worth some extra money to make something special for the Blu-ray. What’s featured is a flubbed version of the scene where Rocket is getting into a mining pod on Knowhere and telling Groot that he won’t be able to fit. While I won’t spoil what happens, it’s a fun little moment. 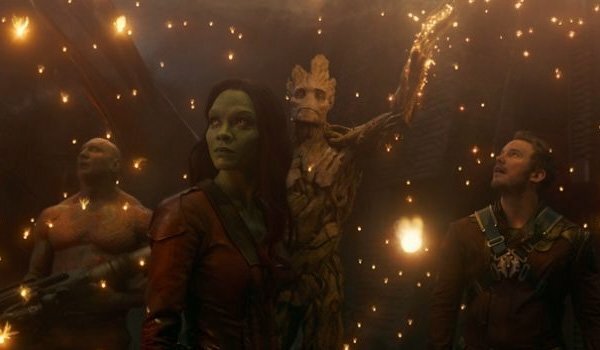 Featured in the deleted scenes of the Guardians of the Galaxy Blu-ray is an extended version of the police lineup scene after Star-Lord, Gamora, Rocket and Groot get picked up for fighting on Xandar. 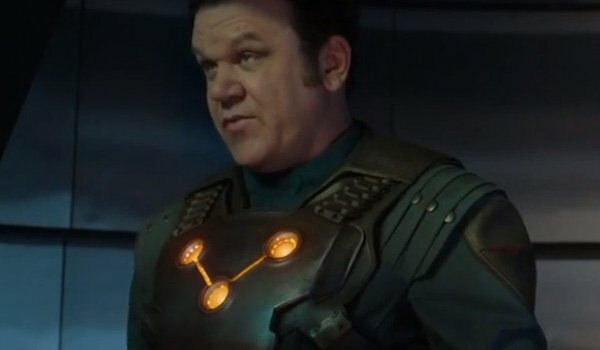 Going beyond the moment where Peter Serafinowicz’s Denarian Saal calls the future Guardians "A-holes" and ships them off to the Kyln, the scene continues with Corpsman Dey (John C. Reilly) protesting, saying that the brutality of the Kyln is too harsh a punishment for the criminals. At first there is a funny back-and-forth due to the fact that one of the lights on Dey’s armor is off, but then Saal shuts him down hard, insisting that the Kyln is where they need to be. While it’s Gamora who ultimately gets to Peter Quill first while he’s trying to sell the orb on Xandar, it turns out that she wasn’t the only one that was right around the corner. 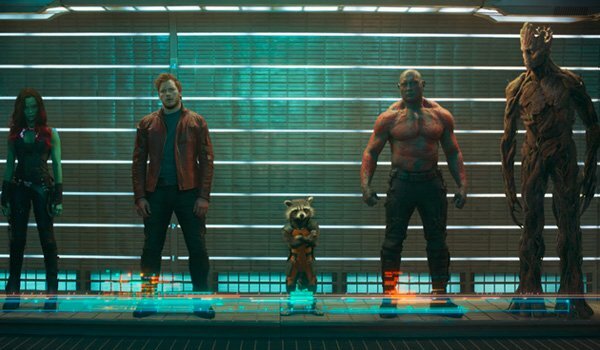 In a deleted scene, it’s revealed that Rocket and Groot are right outside Broker’s storefront as well, hatching a plan for how to capture Quill. While the fuzzy bounty hunter goes over the plan, however, his buddy gets a bit too distracted by a little bug to pay attention. At the end, Rocket declares, "You’re not the idiot, I am. I’m the one who partnered up with a tree." Just about everyone who saw the film fell in love with Guardians of the Galaxy’s soundtrack, but there is actually an additional musical sequence available on the Blu-ray. 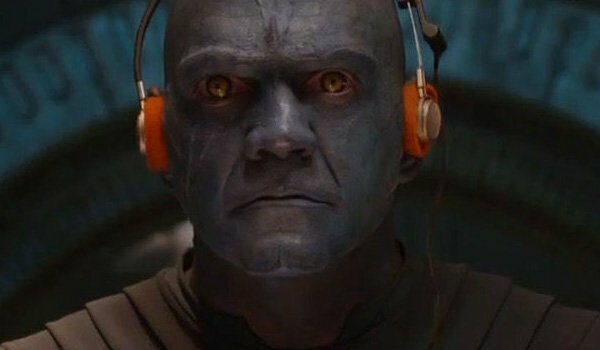 Featuring the song "Magic" by Pilot, the sequence centers on the blue alien guard who steals Peter Quill’s Walkmen (played by actor Spencer Wilding) dancing his way through the Kyln. James Gunn actually teased this one back in September, but now that we’ve seen it we can confirm that it’s fantastic (and quietly wish it were still in the movie). Guardians of the Galaxy will be available on Blu-ray and DVD December 9th.